Monday was a public holiday and it turned out to be a great day for running. The weather was warm, the skies clear and I was in the mood for some running. I ran the Reading Runner's Shinfield 10k, my first 10k for the year. As this is known to be a fast flat course, I also thought it would be a good chance to set myself a new "since returning" personal best to get the running season off to a good start. 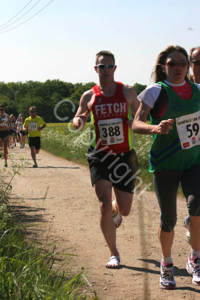 Prior to this race, my PB was 44:26 run on the Yateley 10k course. I've been training a lot more carefully and consistently this year so thought a PB was definitely on the cards and aimed for what I thought was a good time of sub-43 mins. I started the race as I usually do - too fast - but for some reason it felt right and the pace - about 3:56 - 4:00/km - was very comfortable. Given I'm concentrating on 5k this year, I thought maybe it was because I've been consistently running as faster paces in training that this faster than planned pace felt so comfortable so I stuck with it in the belief I'd probably slow down dramatically at 5k or maybe 6. Well, I did slow down on the 5th km, but not because I was tired from going too fast, but because the 5th km had the water station in it. I've still not mastered drinking water from a cup whilst running and really miss the Miltons tasting water baggies we used to get in South Africa. The 6th, end of the 8th and all of the 9th kilometers were slow due to a strong head wind and I finished off the 10th nice a quick. As the 8th and 9th kilometers were hard due to the wind and I like to push the last kilometer, I didn't actually check my watch for about 2.5 to 3km so had no idea how close I was to my goal of a sub-43 so imagine my surprise when I rounded the corner onto the finish straight to see the clock saying 40:30. Huh!!! 40!! I was shocked. Without even trying to I'd nearly run a sub-40 10k at the very beginning of the season. In the end I finished in a time of 40:42 and was as chuffed to bits. I still can't believe I managed such a great time. I definitely believe I have a sub-40 min 10k in me this season but I wasn't expecting one until at least next year. As this was a race and I'm now racing in minimalist shoes, I raced in my Vibram Five Finger Bikilas. What a good idea. Several large sections of the course had very questionable tar, some very course concrete and a long offroad section as we crossed a field between 8 and 9km. Had I been barefoot, I think my goal of sub-43 may have been a little over optimistic. So all in all a brilliant start to the season. The official results are now out and I came 59th out of 696 runners. Not bad at all. I'll definitely be doing this one again next year.